Two more snippets about Microsoft's DirectX 12. First up is the news from FUD Zilla that most of the current graphics cards that support DirectX 11/11.1 will be able to take advantage of most DirectX 12 features. A new GPU will still be required though if you want to unlock the full potential of DirectX 12, but there's probably no need to rush out and buy a DX12 GPU when it comes out as game developers will likely need a lot of time to optimize their games for the new API. Microsoft didn't share much about DirectX 12 other than they will have more specifics coming at GDC. Microsoft said that it was working with DirectX 12 card vendors to insure that most modern PC gaming hardware will work well with DirectX 12. WCCF Tech reports today that Microsoft silently launched DirectX 12 on Windows 10. 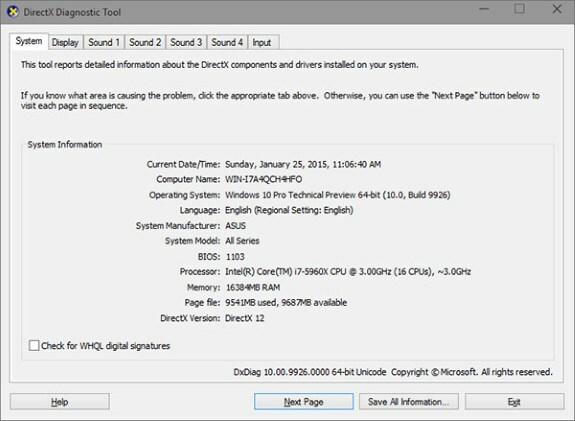 The dxdiag tool in the latest Windows 10 technical preview reveals the newest build of Microsoft's next operating system contains DirectX 12 but so far you can't do much with it as GPU makers haven't launched any DirectX 12 drivers yet and there aren't any compatible games either.